The Department of Asian Studies is pleased to invite you to our 11th Annual Harjit Kaur Sidhu Memorial Program. 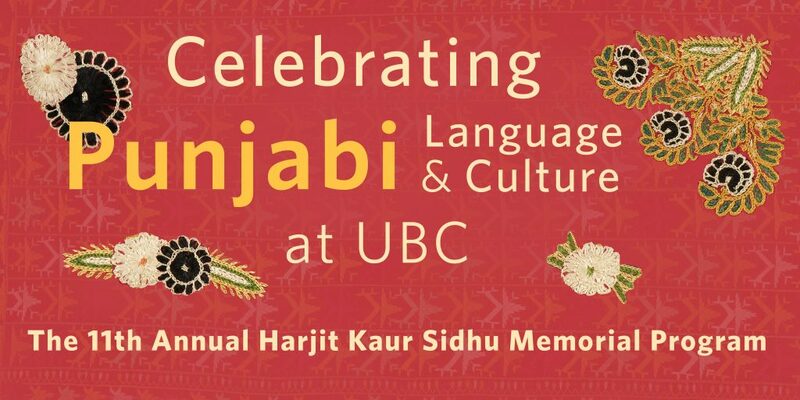 Join us in celebrating over 30 years of Punjabi language at UBC on March 14th! Due to measures outside of our control, original speaker Mushtaq Soofi will not be joining us. The event, Language and Politics in Pakistan: The Case of Punjabi, on March 13th has therefore been cancelled. Made possible by the generous support of the Sidhu family, in loving memory of Harjit Kaur Sidhu (née Gill), devoted wife, mother, and strong advocate for education, Punjabi culture and language, and women’s issues. Organized by the Department of Asian Studies and co-sponsored by the Centre for India and South Asia Research and the Office of the Dean of Arts. Thanks to our media partner Spice Radio 1200AM. Why is Punjabi Studies Important at UBC? The Harjit Kaur Sidhu Memorial Program celebrates the rich life of Punjabi language and culture and its importance in BC, in memory of a woman who shared such passions. Our goal is to call attention to important new scholarship on Punjabi language and culture and bring it to our students and the broader Vancouver area audience; encourage and recognize achievements in Punjabi language cultural production; and honor students for their work in learning and using the Punjabi language. Want to stay up to date with Punjabi Studies news and events at UBC? Our online registration form is now closed. We are still accepting registrations at the door.